My love affair with raw fennel is far from over. Perhaps it’s a love of all licorice-like things. Anise – yes, love it. Fennel seeds – yep, them too. Ouzo – err, reminds me of my introduction to the Pink Palace on Corfu as I was 19. Fell in love with Greece back then, but I never developed a love affair with ouzo. Thinking of all things licorice…remember those black licorice ropes? Loved them. And they are still 34 inches long (that’s 87 cm!) even still after 50 years! Bags of chips may get smaller but not licorice ropes. During my travels to Amsterdam a couple times a year, I am always amazed at the shear assortment of licorice they have. It’s such a small country and there is so much licorice! A Dutch colleague recently told me that the Netherlands has highest per capita consumption of licorice in the world (almost 2 kilograms per person per year!). Yes, the Dutch love their licorice. But actually it’s not the kind of licorice you are thinking about. It’s nothing like Twizzlers or even close to the North American slightly-salty, black, dense and chewy candy we know as “licorice”. No. The Dutch prefer a slightly more offending version. Let’s call it “drop”, as the Dutch do. Drop being Dutch for “licorice”. Drop is a bit of a Dutch culinary icon. There is a flavor or type of drop for every taste from sweet to salty, hard to soft, small, big – you have it. They also have some pretty creative flavors and shapes. From monkey heads, to starfish and sea shells covered in sea salt, to tiny licorice keys, cell phones and watches, to horse heads (Macho Maffioso) just for those Godfather fans…honey flavored, flavored with ammonium chloride for a salty, tangy flavor or given a sugar-coating (even banana flavored) …or even filled with a shocking amount if salt in the middle. You got it. Now that’s what I call a love affair with licorice. Thanks, but I’ll stick to my licorice ropes. So back to MY love of fennel. Perhaps there is nothing new about combining fennel’s sweet anise flavors with juicy bittersweet grapefruit. But really a simple combo of great flavors that so nicely compliment each other can never be wrong. With the addition of fresh, crispy celery, some of the most simple combinations can be so utterly magical. I love this salad! As preparation for this pink grapefruit, celery and fennel salad you need to section the grapefruit. To do so, use a sharp knife, peel the grapefruit and remove all of the bitter white pith. Working over a bowl, cut in between the membranes to release the sections, squeeze the juice from the membranes into the bowl (reserve the juice). 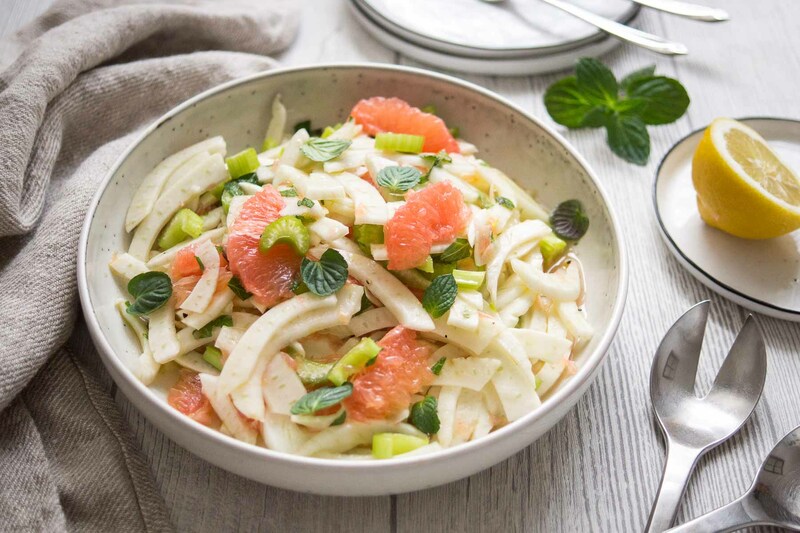 A fennel salad with sweet anise flavors, juicy bittersweet grapefruit, crispy celery. A simple combination that is absolutely delcious. In large bowl, whisk together 1 tablespoon (or more) of the reserved grapefruit juice, olive oil, lemon juice, chopped mint, salt and pepper. Add the sliced fennel, grapefruit, and celery; toss gently to combine. Season with salt and pepper, to taste. Serve and enjoy! 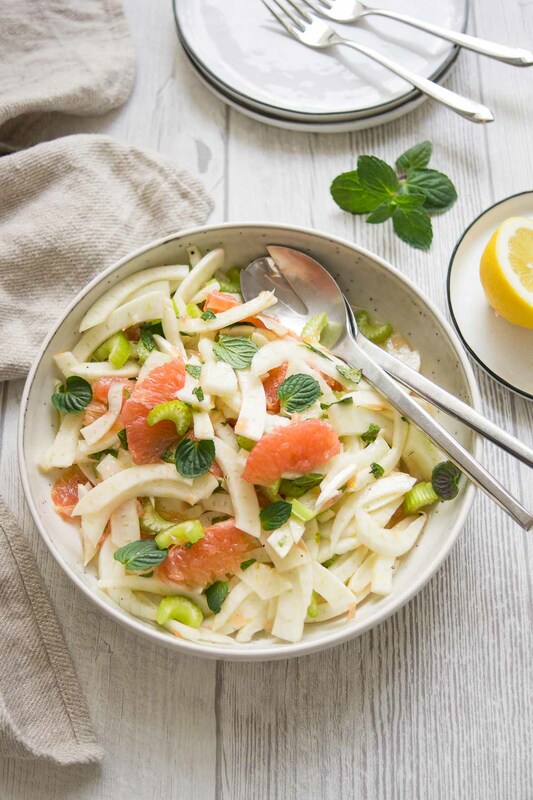 If you make this Pink Grapefruit, Celery and Fennel Salad recipe, I’d love to hear how it turned out for you! Be sure to rate it and leave a comment below to let me know! Especially if you have tips for other readers. Or take a picture and tag me on Instagram @ellerepublic and don’t foget to hashtag #ellerepublic so I don’t miss it!